The first recipe that comes to my mind when talking about mexican recipes and a favorite to many is the guacamole.Its a very good dip served with tortilla chips/mexican bowl rice made out of ripe avocados.The homemade guacamole is very simple to make and is very relishing too.Avocados have known to have cholesterol lowering properties.And thus its a very healthy dip too.We enjoyed this with tortilla triangles.Do try this creamy delicious dip !! 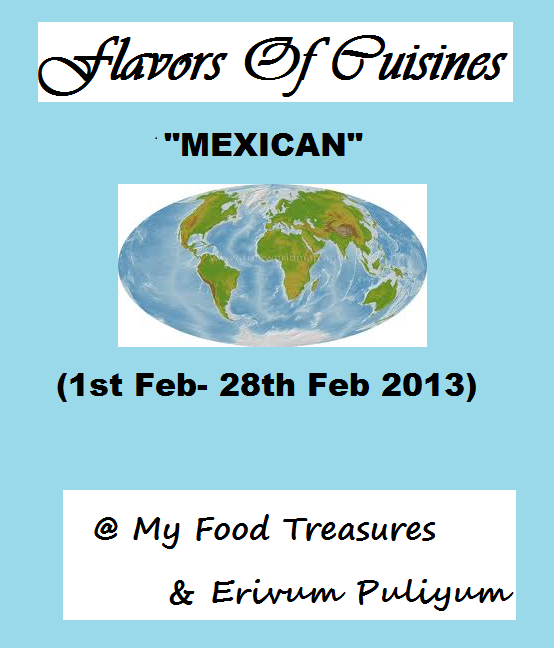 PS: The new series with Flavors of Cuisines is started off @ My Food Treasures with the theme "Mexican".Link up your entries soon.Also,a word of thanks to all my enthusiastic bloggers who signed up for guest hosting the series,friends.I was overwhelmed with joy to see the guest hosting response,dearies.Thank you all,Hope this will be interesting with the trying & learning the flavors across the world. -Wash the avocado,slit half way.Pitted and scoop out the pulp.Mash it smooth with a fork or spoon. -Add in all the chopped veggies.Squeeze out the lime and add salt & pepper. 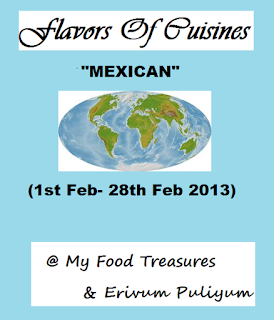 -Keep chilled for a few hours so that the flavors are blended well if you have time or else serve. 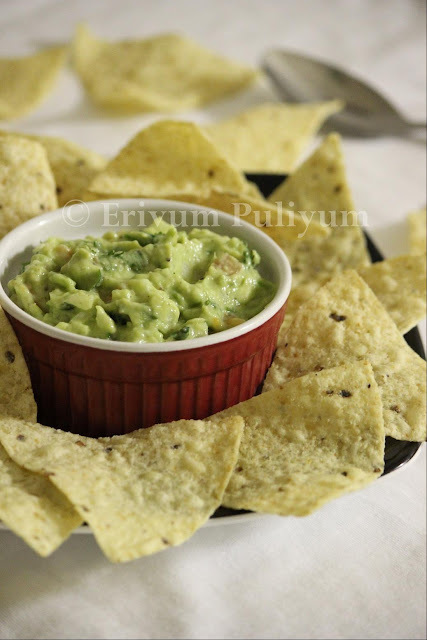 -Serve with tortilla chips,tortilla triangles or as topping for mexican rice !! * Avocados tend to brown very fast so prepare and chill immediately. * If u don't like the strong smell of onion,then use scallions /green onion. * Remove the pulp from tomato if you want your guacamole to be creamy. 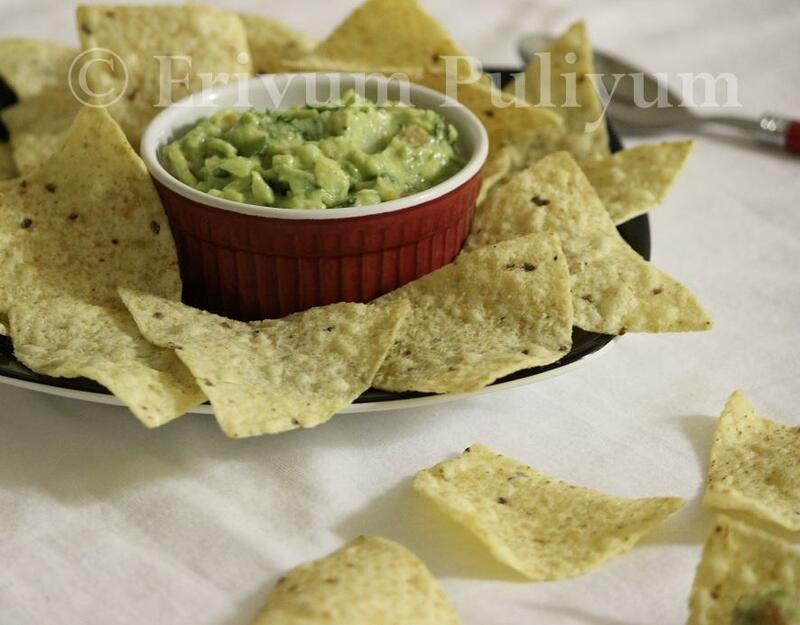 My favorite dip, missing good avocados here..
nice presentation and beautiful clicks dear..
Just munching some chips, wish I could dip as its so tempting. Wow Julie this is amazingly beautiful pic. I want to grab the bowl and the chips. as for the event will send my entry. Honest. Hey Julie, same pinch! I also made guacamole yesterday..but mine was little different. Looks good with the chips! Love this tasty and yummy dip always dear. Looks very tasty and inviting Julie. Can't imagine the taste. Looks tempting. I also have an old Gucamole post on my blog...love your pics...simple n clean! The dip looks awsome and healthy too. My most favourite dip,love it. I still haven't got an entry to our event... Will come soon. nice clicks, the dip looks yummy! 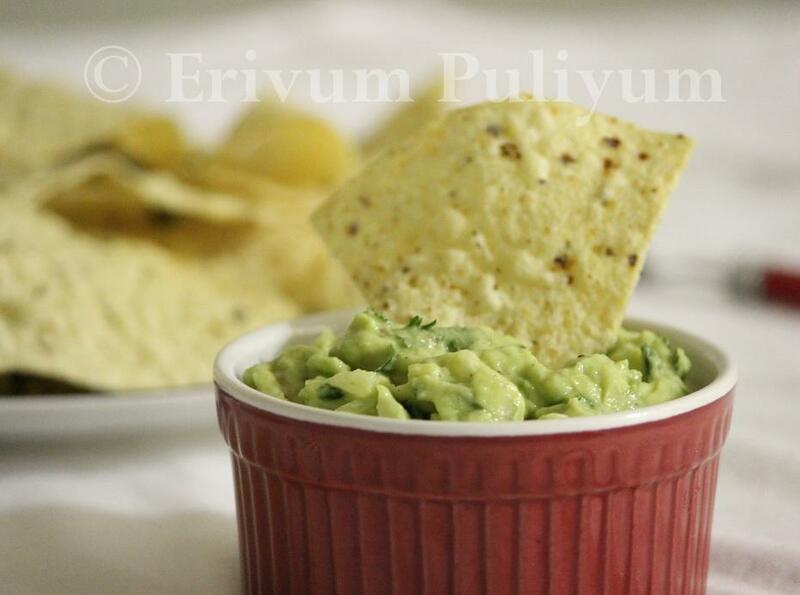 Love guacamole and this looks delicious! such a versatile dish.. looks super yum! I want to eat some now, sitting in front of the TV and eating some dip n chips! hi julie, sure love this guacamole dip cos i love avocados. healthy and tasty way to have avacado..nice presentation..
YumYum.. I so wish I had some avocados here! !